If you read my post from this afternoon (below this one), then you know I have been waiting to try Smitten Kitchen's mom's Jewish apple cake recipe, and it's been baking in the oven. It's done, and looks beautious! The crust is a little dark, so after I took the photo, I sprinkled a little powdered sugar on top. The cake tester said it was moist, full of apples and he LOVED it! 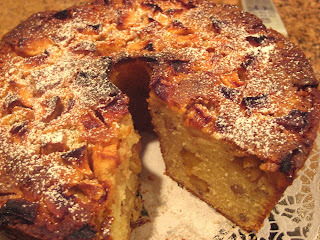 So thank you Debra, for sharing your mom's famous apple cake with the world! Another cake recipe for my repetoire! looks delicious! Glad you put both the "before and after powdered sugar" pics! I LOVE Jewish apple cake. This one looks so good! Looks great - and I hope you are feeling better. YUM! 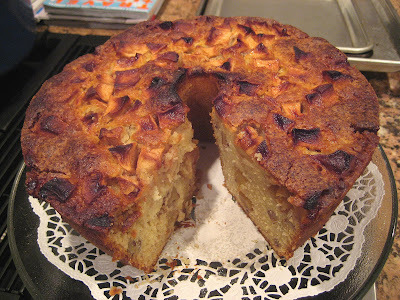 I made an apple cake last night too, I posted it if you want to check it out! 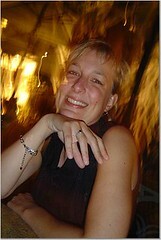 Stacy this looks wonderful. Its just the season for it! Sta I made Smitten Kitchens Chocolate Chip Sour Cream Cake and it is evil!!! Ive been having a piece with nearly every meal, It actually calls to me from the kitchen no matter where I am in the house. I am putting myself out of my misery today and have packed up what is left to go to my little college girl and her dorm friends. TRying to save myself!!!!! may be too late though!! !